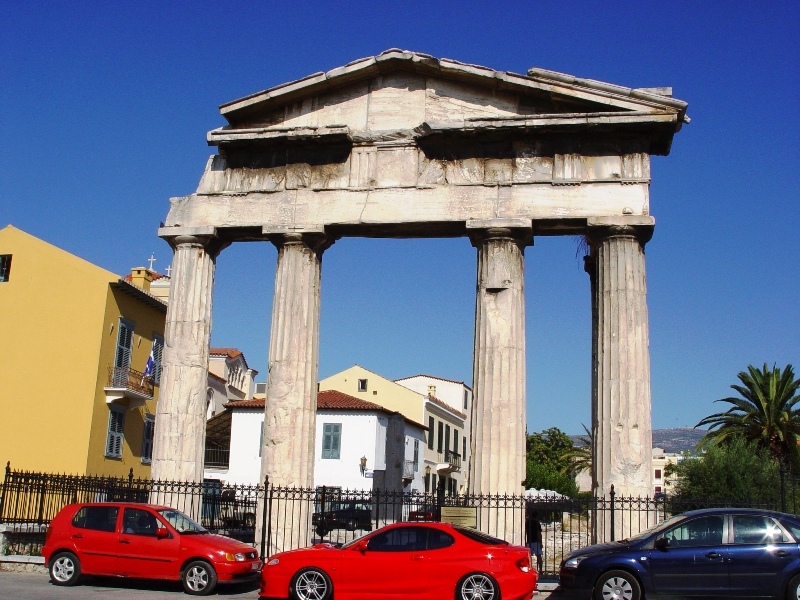 Situated on the west side of the agora in Athens is the Roman forum Gate of Athena. It was constructed in 11 BC. It has four Doric columns, with a base of Pentelic marble. According to the inscription on the architrave, the gate was dedicated by the Athenians to their patroness Athena Archegetis with funding by Julius Caesar and later Augustus. Gate of Athena Archegetis in Athens. Photo by Leon Mauldin. It is amazing to see ancient ruins surrounded by modern buildings, not to mention the vehicles! This entry was posted on Tuesday, January 25th, 2011 at 9:55 PM and is filed under Athens, Bible History and Geography, Bible Study, Greece, Travel. You can follow any responses to this entry through the RSS 2.0 feed. You can leave a response, or trackback from your own site. WOW! That is such a sight! A modern sports car in front of an ancient gate. The Athenians probably would have bowed down to worship anyone that drove up in that (Acts 17). Haha!